Our world is not quite as small as we think it is. Travelers to other countries have to overcome many difficulties in order to enjoy the true flavor of the local inhabitants and their customs. Being a well traveled person myself I have found that the language barrier is often the first hurdle that you have to overcome. Time and again I find myself sticking fingers in my ear while I say "telephon, telephon please" to some non-English speaking passer by. "Where is the telephone?" is an easy one. Try "How can I find a Toilet?" or "What time is the next train?" not as easy. The last time I found myself in difficulties with a foreign language I thought of a simple solution to this problem. Answers to questions could be just a finger point away. The obvious solution would be to carry around some carefully chosen easily recognizable international symbols printed on a piece of paper. When I had a question like "Where are the elevators?" I simply held up my piece of paper and pointed to the symbol for an elevator. I was amazed at how well this system worked. The drawback was that I would mutilate or loose my symbols cheat sheet and be back to sticking my fingers in my ears in no time at all. 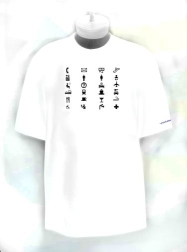 When talking with other travelers about my attempts of overcoming a language barrier the overwhelming consensus was to print the symbols on an article of clothing that you could wear. I took this idea home and designed the first international Traveling-T.
A few years have past since that first Traveling-T made its successful tour of Europe. The observations that others and I have made while using the Traveling-T have enabled us to improve the design and durability of each new generation of shirt. So today, our newest and most innovated line of the international Traveling-T is now ready to accompany you on all of your travels. Our Traveler’s Giftshop offers this unique companion to all you web savvy travelers. Home or away the Traveling-T will prove to be a great conversation piece. Here are the 24 international symbols that we found most useful when traveling. See how you can communicate effectively at all transportation hubs, large international events or even in your own home town. Just point to the appropriate symbol on your Traveling-T and get your questions answered no matter what language the natives speak.